We aspire to be immersed in our experiences with art – yet, most often, there’s an invisible wall separating us from that divine experience. In fact, that wall isn’t always imperceptible – a thick line on the ground, a velvet rope, an alarm system, or even a human shield prevents us from piercing the atmosphere of the artwork before us. This practice has become customary, acceptable – even expected – in museums and galleries alike, despite the differing nature of their promotion of fine art – the former as a conservator, the latter as a commercial proprietor. True, to preserve seminal works of art history, it is our responsibility to protect them. But, a new age is upon us, a globalized era in which we are insistent that our opinions be heard, vying to be included. It makes sense, then, that smart artists might begin to echo this sentiment, by not only allowing, but encouraging viewer participation as a means to champion a more invested experience with their art. Dan Levenson has wisely chosen to march down this much less-traveled path, creating a covetable body of work built around a fictionalized narrative about a group of art students studying in Switzerland at the obsolete State Art Academy, Zurich (SKZ). The most recent edition of this narrative, SKZ Painting Storage, currently on display at Susanne Vielmetter Projects in Culver City, seduced me not only with the work presented, but also through the interactive experience encouraged. 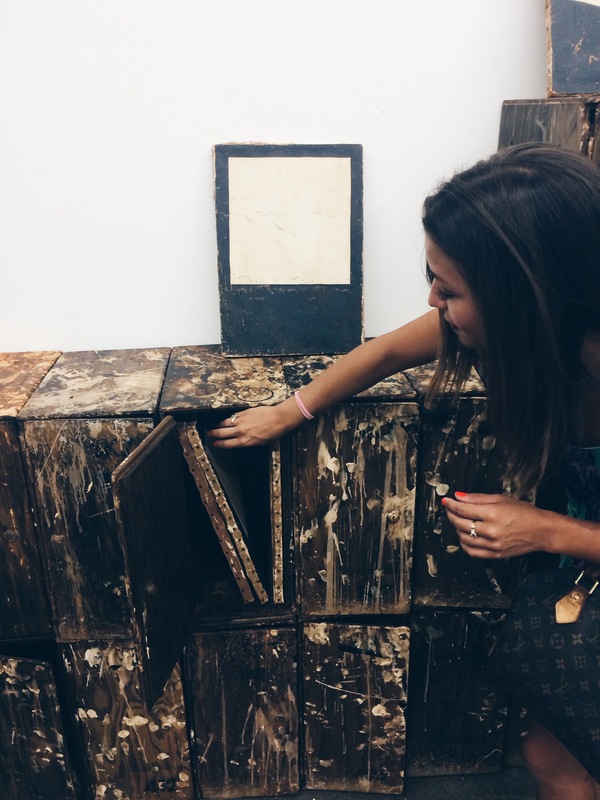 Levenson creates wooden lockers that appear to have been rescued from the rubble of SKZ, splattered with paint and stuffed with distressed canvases, each signed on the back with the name of a different “student.” The viewer is invited to step into this world – half fiction, half reality – as an integral part of the artistic process, encouraged to sift through the lockers and create his or her own display of canvases to set atop the lockers. Levenson has been running with this narrative, ripe with possibilities, for the last four years. The lockers and distressed canvases are a thematic consistency. 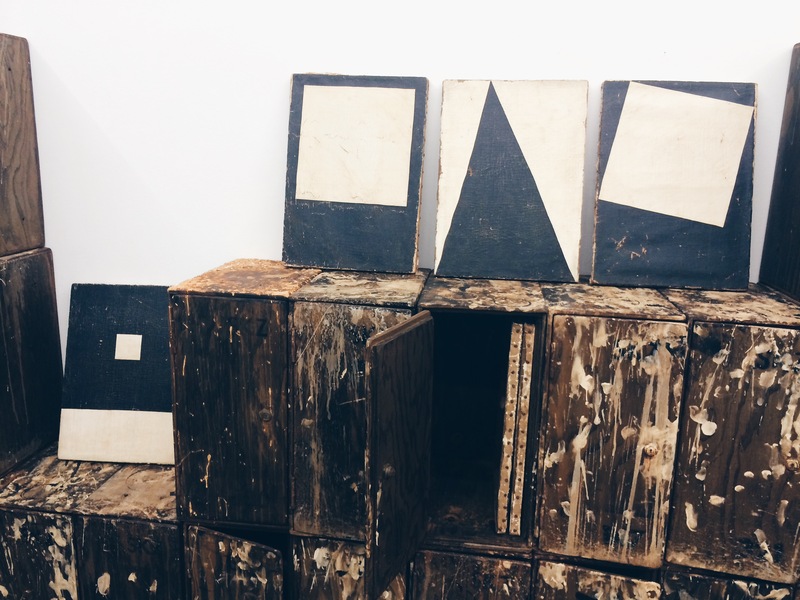 But, in his current show at Susanne Vielmetter, a few key components surprised me. Rather than continuing to work with color oil paint, the hundreds of canvases in this exhibition are monochromatic. 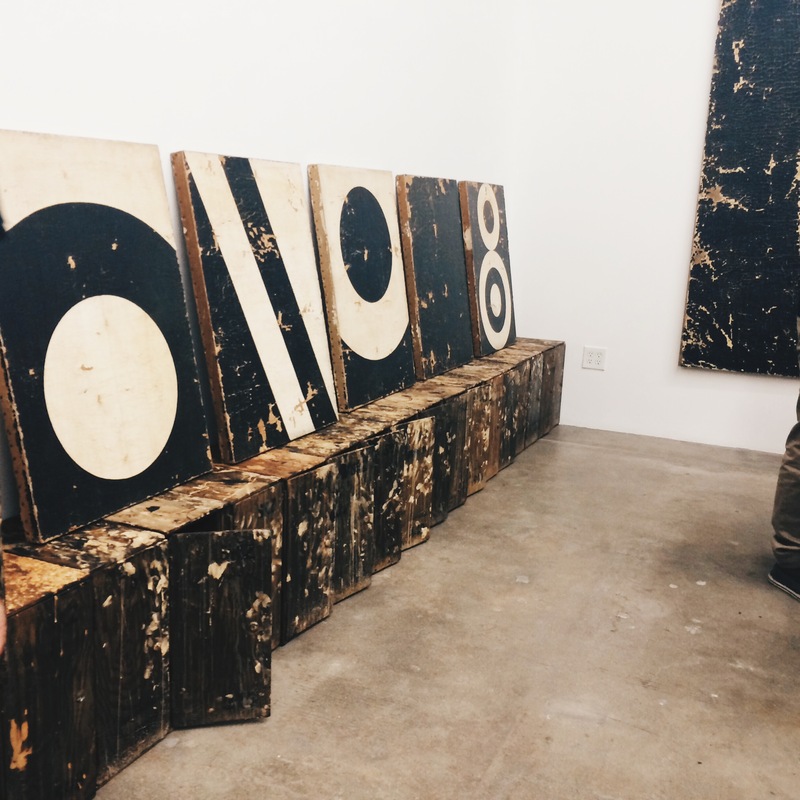 Levenson primed each raw canvas with gesso, and used only black paint to create geometric forms, evoking the ethics of twentieth century institutions such as the Bauhaus, that prioritized form and technical prowess over content or self-expression. The element of varying scale was a surprise, as well. Lockers this time ’round came in two sizes, small and medium, with storage rafters installed in the gallery for large canvases. The pleasure I felt rifling through these “anonymous” canvases, imagining each in my home, was intoxicating. I had the pleasure of meeting Levenson at the opening reception, who graciously showed me his process of distressing canvases – he paints on a stretched canvas, removes the canvas from the stretchers, rubs the backside against a desk ledge to break apart the oil paint, then re-attaches the canvas to its stretchers with nails. Funnily enough, he revealed that he was inspired to begin severely distressing his canvases after viewing a documentary on art forgery. The entire experience was thoroughly immersive, and solidified my preexisting belief that art ought to be something that we hold dearly, not simply something to be seen clearly. 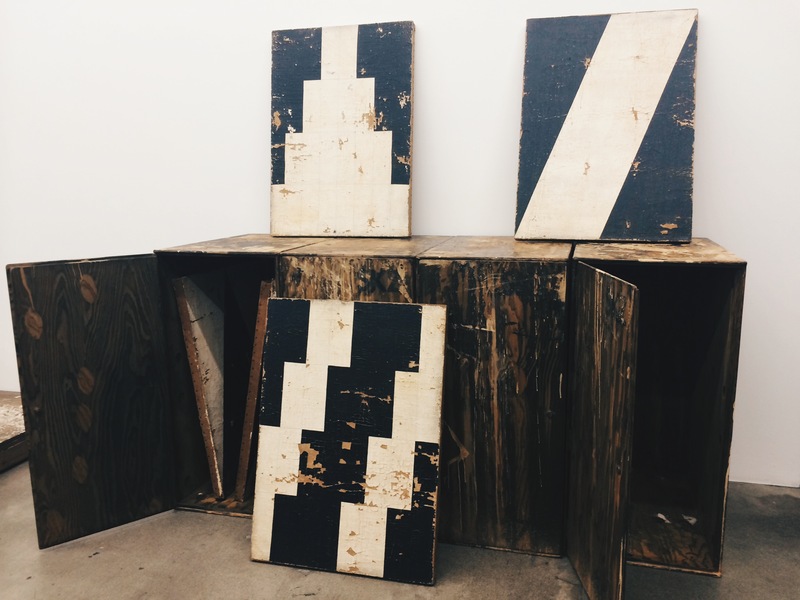 Dan Levenson’s SKZ Painting Storage is on view at Susanne Vielmetter LA Projects through October 10, 2015.